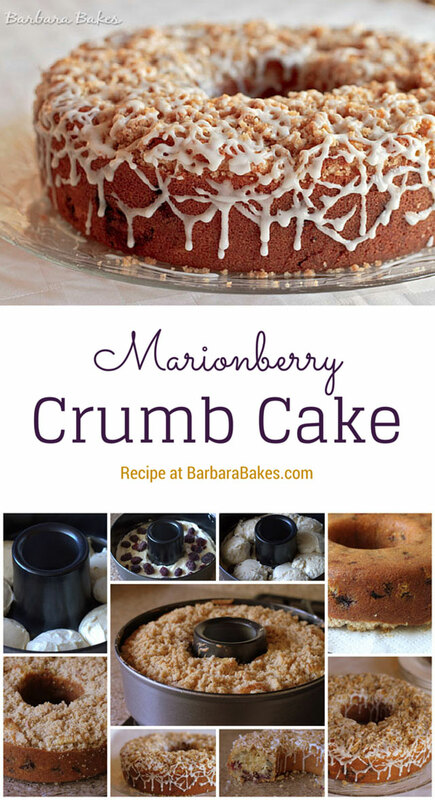 A moist, tender vanilla coffee cake filled with tart marionberries and dried cherries crowned with a sweet, crumbly topping and glaze. A perfect way to start the day. 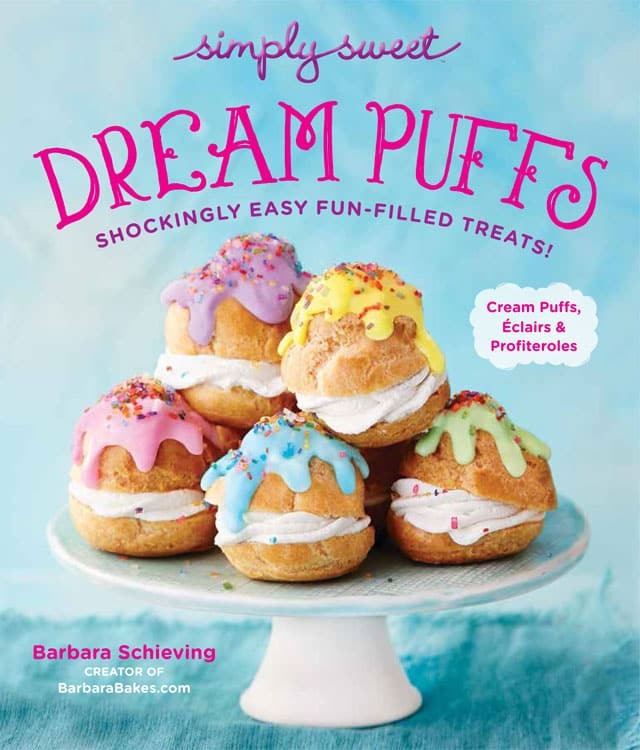 My Secret Recipe Club blog this month is The Pajama Chef. 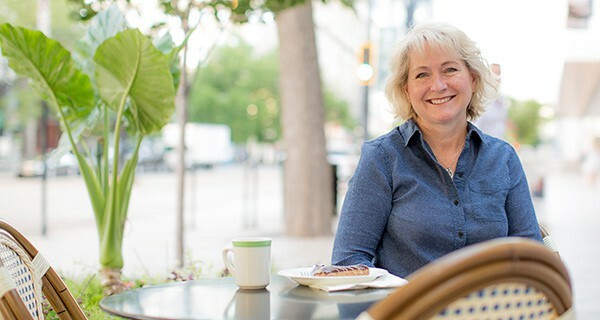 Sarah has a passion for cooking and baking, as well as hanging out in her pajamas. She’s an avid runner and has lots of great, healthy meal recipes on her blog. While I love a great, healthy recipe as much as the next person, I headed to her delicious dessert section first. Sarah’s Cinnamon Sugar Apple Cake looked like a recipe my family would love so I bookmarked it. 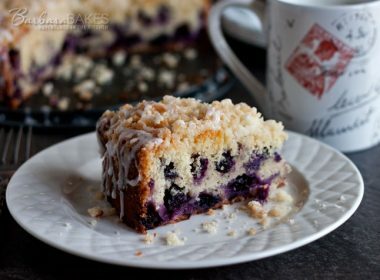 Later when I came back to print the recipe, Sarah had just posted a Royal Berry Coffee Cake which looked to good to pass up. 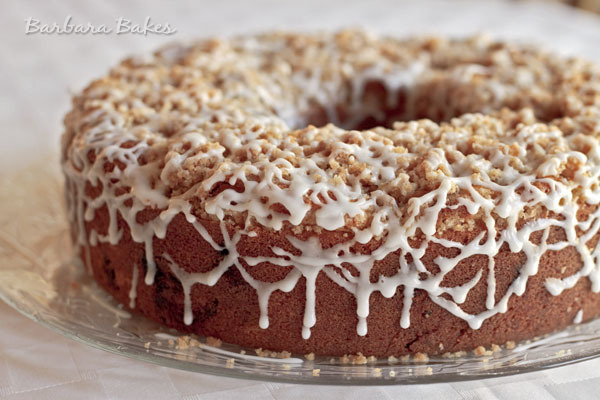 Sarah’s mom made this coffee cake for her years ago from a recipe she found in the newspaper. Originally made with blueberries and raspberries, I changed it up to use what I had on hand, frozen marionberries and dried cherries. 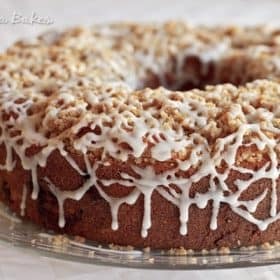 I love a crumb topping on coffee cake, so I reduced the batter by one third and added a crumb topping, along with a light glaze. 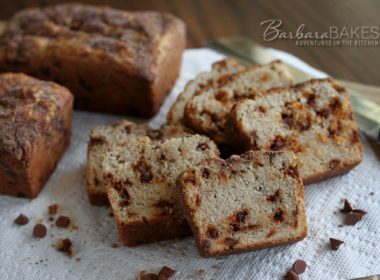 This is a fabulous coffee cake and would be perfect for Mom on Mother’s Day. Thanks Sarah and Sarah’s mom for sharing it. Preheat oven to 350 degrees. 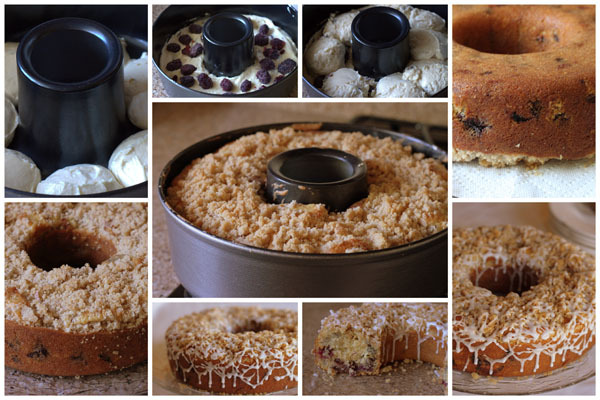 Grease and flour a 13-cup coffee cake pan, set aside. Stir together flour, baking powder, and salt. Set dry ingredients aside. Cream butter in a stand mixer. Gradually beat in sugar. 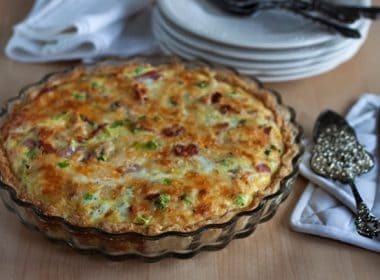 Add eggs one at a time beating well after each addition until mixture is light and fluffy. Stir vanilla into milk in a measuring cup. Then, alternate adding dry and wet ingredients to the cream and sugar mixture, beating well after each addition. Mix in dried cherries. Spoon half of the batter in bottom of prepared pan. 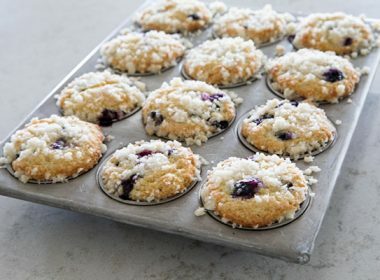 Arrange berries evenly on top of batter, and then top with remaining batter. Bake in preheated oven 25 minutes. Sprinkle crumb topping on top of cake and return to the over for an addition 20 to 30 minutes, or until toothpick inserted in cake comes out clean. Total bake time will be 45 -55 minutes. Visit the Secret Recipe Club for information on how to join in the fun. I don’t have Marionberries but have LOTS of dried cherries, can I just use them in place of the berries? Hi Marion – yes, you could double the dried cherries instead of using Marionberries. Enjoy! It was nice to finally meet you today Barbara! I’m not much of a chatter but I’d love to get to know you a little more next time :). 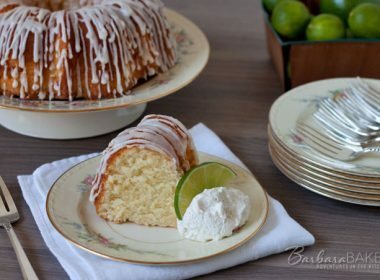 This cake is the most beautifully drizzled cake I’ve ever seen by the way! It was so nice to finally meet you too. Next time we need a round table so it’s easier to chat with everyone. Thanks for the sweet compliment. I do love a pretty drizzle. Thanks! Here’s a link to the pan http://www.amazon.com/Nordic-Ware-Form-Coffee-Cake/dp/B000JZ5VVE. It is a 13 cup pan. If you use a different pan, be careful not to fill it more that 2/3’s full. Let me know how you like it. I’ve never had a marionberry before – but I think I’d love them! And your drizzle on top of the cake is gorgeous and perfect!